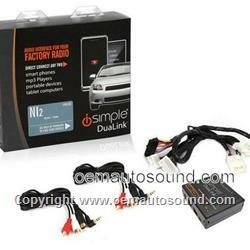 Integrates two auxiliary audio sources directly to the factory radio for the best sound quality. Plug and play installation maintains factory wiring integrity. Two separate inputs, RCA and 3.5mm mini jack, for use with multiple audio sources. Radio must have a "SAT", "CH", or "CHANNEL" button to be compatible. Compatible with select Infiniti and Nissan vehicles. Not compatible in select vehicles that have GPS Navigation. Vehicle MUST be either equipped with, or have the ability to support Satellite Radio Radio must have a "SAT" button or have "CH","CHANNEL", "CAT" or "CATEGORY" printed somewhere on the face of the radio to be compatible (except Rouge,see below.) This is usually located near the Tune or Seek buttons.